This month, we celebrated Independence Day and I was honored to meet with veteran organizations in Washington, D.C. to discuss the importance of providing high-quality education to members of the U.S. Armed Forces and veterans. RADM Rich with 2016 National University Military Scholarship recipients. Spending time in our nation’s capital with veterans, who are working hard toward their education goals, caused me to reflect on National University’s beginning as a military-serving institution of higher learning. Our founder, Dr. David Chigos, was a Navy retiree who worked for General Dynamics and believed in the University’s mission of meeting the needs of working adults through quality education. Today, about 25 percent of National University students are active military or veteran status, and in San Diego, an estimated one million members of the armed forces will be transitioning to civilian life in the upcoming years. At NU, we honor the contributions and sacrifices that these students have made by providing them with access to quality education and resources as they transition out of the military or advance their military careers. We all have an obligation to honor our veterans, and at National University, we are so proud of the hard work that our military students contributed during their years of service to our country. It is no surprise that some of the most popular programs among these students are those that allow them to continue to serve their country here at home. Many students find their leadership skills fit well with our business programs, while others find teaching to be their calling. Our accelerated Vets to BSN program allows veterans with medical training to earn their nursing degree at an accelerated pace. Many veteran students continue to protect us by earning their master’s degree in Cyber Security and Information Assurance. In fact, National University is the first university in San Diego to be recognized by the National Security Agency and the Department of Homeland Security as a National Center of Academic Excellence in Cyber Defense Education. 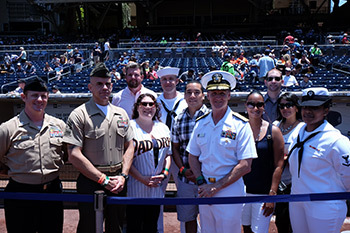 NU and the San Diego Padres proudly support our military and veteran community with the National University Military Scholarship Program. 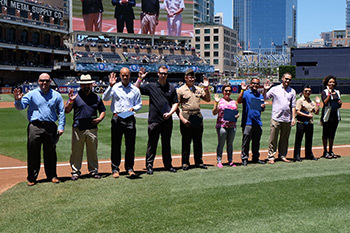 We are honored to serve our military students and support their continued success with the National University Military Scholarship Program, in which we partnered with the San Diego Padres to provide scholarships to military and veteran students who have demonstrated academic success. Furthermore, the Center of Excellence for Veteran Student Success, created more than five years ago, has served thousands of students with academic support and career transition. I am pleased that National University is continuing our founder’s commitment to advancing lifelong learning opportunities and dedication to ensuring the military community has access to quality education programs that provide them with relevant, challenging training that supports their continued successes.